This post is primarily addressed to bishops, pastors, elders, and other church leaders. I know you want as many people as possible in your sphere of influence to come to saving faith in the Lord Jesus Christ. Isn’t that why you got involved in ministry? Very few members of your church will ever go on the mission field, but nearly all of them will have a mission field of Jehovah’s Witnesses come to their door sometime within the next year, asking to talk with them about God and salvation. Imagine how different the lives of these Witnesses would be if every Christian from your church invited them in and gave them an effective presentation of the gospel. Now imagine what would happen if they received such a witness from every Christian in your community, regardless of what church they attend. Why not start evangelistic classes or small groups to equip your congregation? You can use my book as a training guide. If you would like further help, feel free to contact me. If you are a preaching or teaching pastor, I think you will find that the information in my book can provide a lot of material that you can use yourself for sermons that teach doctrine, instruct in apologetics, and equip your congregation for effective evangelism. Will you join with me to help prepare Christians to reach out to Jehovah’s Witnesses with the word of God? The paperback edition of the book is available for $14.99; the Kindle edition is available for $9.99. If you order the paperback, you can get the Kindle version free under Amazon’s Matchbook program. 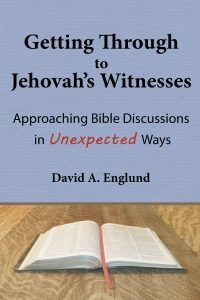 If you are a church leader and would like a free digital copy of the book (which can be read on Kindle and on Kindle apps on your computer, tablet, or smartphone), send an email to David@DAEnglund.com from your church’s email address with your church’s name and your position in the church. I will email you the digital copy, as well as future news or updates. Next week: The blog will resume the “Soundbites” series. Section 5: Now Take Action!